Souths shine, as Panthers struggle. 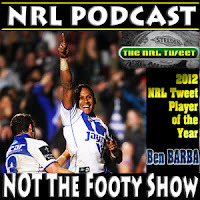 Membership is a funny thing in Rugby League. But then some would have you believe that Rugby League is a funny game. Fans adore their club, put their players on a pedestal and the relatively enjoyment of entire weeks can be shaped by the result of their team's match that previous weekend. Yet despite this affection for their club, not every fan is a Club Member. The NRL has tried many strategies in the past few years in particular to drum up Membership numbers, and while numbers have increased across the league in recent seasons - the logical number of fans relative to actual Members simply doesn't stack up for the vast majority of clubs. More on that point in just a second, but here are the Club Membership numbers that were put out today for the 2013 NRL Season. It makes for great reading for about four clubs, encouraging reading for another four, and slightly more than worrying for the rest. Souths lead the way with 21,006 'Members', followed by the Broncos with 17,237, Dragons with 16,136 and the impressive Knights who have 14,195. Parramatta have done a great job to reach 11,739 after a Wooden Spoon (say hello to the having a new coach called Ricky Stuart factor), Canterbury trail by about 300 at 11,498 and Melbourne (9,745) and the Cowboys (9,178) are both within striking distance of 10,000 before Round 1. Then there are the teams who need a huge injection of something to get up past the 10,000 mark before Round 1... if at all. 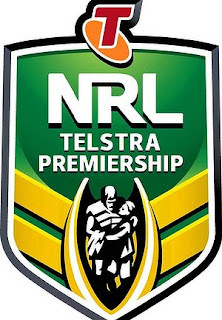 The Roosters sit on 7,689 with the SBW factor, the Tigers have 7,628 after losing their only premiership winning coach, the Warriors at 7,113, Cronulla at 6,812, Canberra at 6,668 and the Titans (6,040) have a very small lead over the Sea Eagles (6,031). Then there are the Panthers - who have seen their roster blow up after the arrival of Ivan Cleary and Phil Gould and a very poor 2012 season sees them sitting at just 3,609 'Members' with just three weeks before Round 1 kicks-off. In case you haven't done the math yet - that's almost an 18,000 'Members' gap between the top club and the bottom club in terms of 2013 NRL Membership. Yikes... yet turning your attention back to the issue of Membership and maybe we get an idea of why there is A. Such a gap between 1 and 16 and B. Why is top Membership number only 20k? This year's Club Membership drive, has seen the NRL using a concept that pushes the idea 'be part of your club' with a video that shows everyday people doing things that are supposed to replicate/mirror what players are doing on the field or on the training paddock. Watch the advertisement and ask yourself - Can more clubs break the 20,000 Membership mark with its help? On paper this campaign's message probably looked great, but the end result is a solid yet unspectacular attempt at connecting to the mind of the Rugby League fan. As you read this after having seen the advertisement - are you connecting to the idea and about to sign up as a Member right now or relatively nonplussed? If it is the latter of the two, it isn't surprising and that's because for the majority of footy fans - they do not respond well to being told how to support their team. For every glorious moment when their team wins the un-winnable game or scores the unbelievable try - fans endure far more moments of disenchantment coupled with relative anger that their team can't get the job done. They choose to react to those highs and lows in their own way, and even when they are Club Members - the feeling doesn't change*. Why sign up as a Club Member if you can live the ride of supporting your team without paying for the privilege? In no way is there a suggestion that signing up as a Club Member isn't a good thing, or indeed not beneficial to the club or Member but the target message the last few years has seemed to be "If you aren't a Club Member, you aren't really a part of it". Now does that sound like the best way to connect with the legions of fans who have supported their team through thick and thin for practically their whole lives but are not Club Members? * Disclosure: As a fan of my team for a couple of decades, I have only been a Club Member for one season. And without embellishing at all, it made no difference to how I felt about my team, or their success or failure on the field. In 2012, I became a member of a different club due to their reduced rate as a trial of that club's membership experience and have been avoiding cold calls like the plague ever since after that club sold my contact details to said 'cold callers'. Having said that - my team is not 'local' to my location - but I believe heavily that if clubs wish to engage their fans and turn them into Members then selling them on the concept of game attendance through Season Tickets is BY FAR the best way to go. Where one campaign being used in 2013 may not be targeted ideally, the NRL has launched a different campaign today and it has plenty of merit. 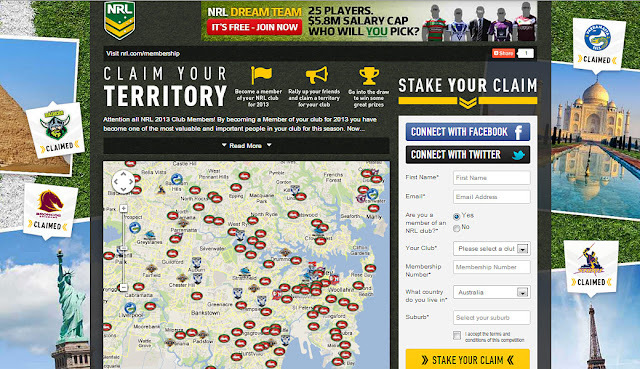 Head to 'Stake Your Claim' at http://member.nrl.com/ and see for yourself. And by the looks of things - Souths not only lead the 'traditional' Membership race, but the 'Stake Your Claim' race in Sydney by a mile! The reason it has merit you may ask is it creates competition between fans - you know the thing they love about footy on the weekend. And in the early stages of this campaign - a few votes/signups might actually make a difference they can see. Unlike the overall Membership numbers which for some clubs is perhaps a sad reflection of how fans currently view the Membership message being put out - giving the fans a tangible way to see how their 'Membership' looks on a map. 'Stake Your Claim' is really a simple campaign that's got potential if fans... err Members embrace it, and like pushing the value of a Season Ticket over a 'You are part of the club' style Membership message - it is more likely to get results and interaction. Because who doesn't want to go to the Footy at a reduced rate? Which is the message getting out to fans... isn't it? So how do we change this mindset people?